Enjoy a central LA City location in CHIC SILVER LAKE with glimpses of the lake and mountains surrounded by treetops. You don’t have to travel out of town for a weekend break; you’re already THERE! Completed in 1980, this spacious Duplex townhouse type complex stepping up the hill, focuses on Lake views and surrounds a private pool and spa. It is the only solo work in the Neutra Colony of architect Dion Neutra, successor partner and principal of the Neutra firm which in 2006 celebrated 80 years in practice in Silverlake under the name Richard and Dion Neutra Architects and Associates. and more recently Dion Neutra Architecture. The complex is unique in the Neutra canon, due to its exterior facing. Use of the shingle siding was dictated by the difficulty of applying plaster or other finish due to the constraints of the site and its shared driveway access to six lots in the subdivision. This finish contributes to the ‘Mountain Cabin’ feel of the complex. Shared swim pool, jacuzzi, laundry, offeet parking for 5 cars under cover; two more in tandem. spacious rooms, dishwasher, great kitchens, several greenhouse windows, multiple decks. The front unit, 2434, about 1200sf, features an oversize step-down living dining room with the feel of a New York urban view. There are two full baths, a guest room or office, and an ample master bedroom suite, and an enclosed 2-car garage. The upper unit, 2436, two stories at 1100sf each features 4BR and 2.5 baths with decks and lake views on all levels, plus a 3-car port. A unique opportunity to enjoy vacation living within 10 minutes of downtown! The result; two unique open airy dwelling units of exceptional quality and desirable views. 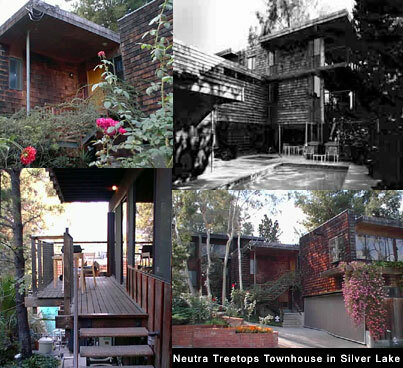 Contact Dion Neutra, Architect, 323 666 1806, or write to dion@neutra.org with your qualifications and particulars. Showings will be arranged by appointment.